"A healthier version of a classic!" Blend almonds in a blender or food processor to the consistency of bread crumbs. Transfer ground almonds to a shallow dish and add 2 tablespoons Parmesan cheese, salt, pepper, and Italian seasoning. Place chicken in a resealable plastic bag and pound, using a meat mallet, until about 1-inch thick. Press chicken into almond mixture until evenly coated. Heat coconut oil in a skillet over medium heat; cook chicken until a nice crust forms, about 5 minutes per side. Transfer chicken to a baking sheet. Bake in the preheated oven until chicken is no longer pink in the center, 20 to 25 minutes. An instant-read thermometer inserted into the center should read at least 165 degrees F (74 degrees C). Heat pasta sauce in a saucepan over medium heat until warmed through, 3 to 4 minutes. Pour over cooked chicken and top with remaining Parmesan cheese. Turn on oven's broiler. 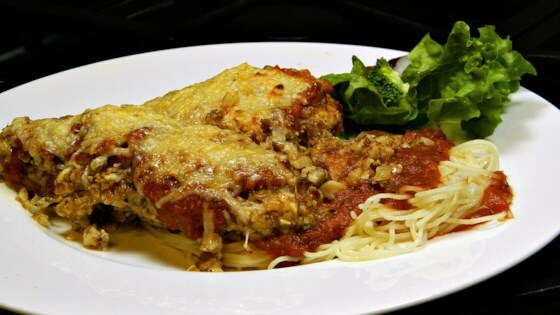 Broil chicken Parmesan until cheese is bubbling and golden, about 3 minutes. See how to make a super-simple baked chicken dinner. Any shredded white cheese such as mozzarella cheese can be used in place of the Parmesan cheese.